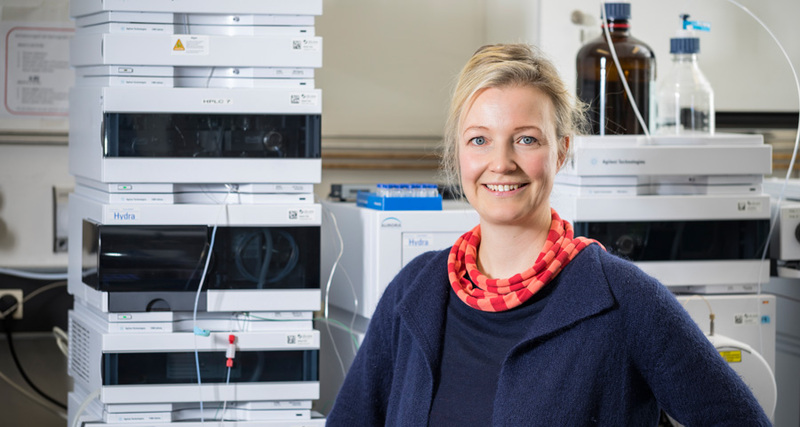 Her US colleague’s research served as an important basis for Dörte Rother’s own developments, as she also works with enzymes. These biological catalysts accelerate chemical reactions, enable body cell production, and maintain the process of digestion, amongst other things. Rother’s work group at Forschungszentrum Jülich devises and optimizes new enzymes and develops production techniques. “When people ask me about my job, I explain that I do research in the field of biocatalysis—that is to say, I use enzymes or whole cells to produce medicines or their components, ideally from renewable raw materials.” For example, waste products from the processing of corn or sugar cane can be used to produce an active substance for cough syrup. Rother’s speciality is what are known as enzyme cascades: Various successive reactions take place thanks to a combination of enzymes. A complex active substance can thus be generated in several stages. With her co-researchers, Dörte Rother synthesizes many so-called optically active substances. These are described as “optically active” because they can rotate the polarization direction of light—such as the left-handed or right-handed lactic acids in yoghurt. One can picture them as an image and a mirror image, yet they can have very different effects in the body depending on their form. To be used as medicines, they must be ultrapure, i.e. in just one of the possible molecular forms. “This is where biocatalysis offers one major advantage: Enzymes are nearly always more specific than chemical catalysts, which are commonly used in the industrial production of medicines.” Instead of a mixture of substances that have to be laboriously separated, enzymes produce pure substances. The waste products that come from the production of chemical substances are therefore avoided. Biocatalysis also saves energy, since enzymes work best under natural conditions. They do not require high temperatures or high pressure, and they are biodegradable. Dörte Rother has always been fascinated by the environment. “At the age of three, I told my parents that I wanted to be a ‘billologist’,” the researcher recounts with a smile. She was inspired by her father, who was a biology and geography teacher, and by an uncle, a marine biologist who traveled to Antarctica on the ‘Polarstern’ research ship. Although other disciplines such as medicine, sports journalism, and landscape architecture also appealed to her, she decided to study biology. The young professor currently describes herself as a biotechnologist. “I am interested in the technical application of biological aspects,” she explains. And she likes working with scientists from a wide range of different disciplines; in her team, engineers, chemists, and biologists all work as one. In collaboration with partners in industry, Rother therefore aims to implement biocatalytic processes at the production level and to produce medicines, chemicals, and materials such as bioplastic in an environmentally friendly manner. “We have to think in this direction if we want to leave behind an environment worth living in for our children.” Rother would also like to pass on these issues to the next generation of students through her teaching at RWTH Aachen University. She is currently working on developing enzymes that can be activated and deactivated by light or temperature. “Our objective is to be able to accurately control the process of our reaction cascades using several enzymes in a single reactor,” she explains. She has won numerous awards for her work; most recently, for example, she received a starting grant from the European Research Council and is being funded as part of a FET Open project (“Future and Emerging Technologies”). Rother remains modest despite all the awards she receives, as she does not see them as her own personal achievement. “If you are passionate about your work, if you are creative and promote fresh ideas, then something new may emerge—with a bit of luck this will be a good process or a product that wins you an award,” she says. The most important factor is a good working environment and a network of colleagues with different specializations. The exchange of knowledge between Europe and Africa has previously been a one-way street – from north to south. A geoscience project now shows that traffic in the opposite direction also makes good sense. Björn Fiedler and his family left their home in Kiel, Germany to spend six months in Cape Verde. The marine chemist had been posted at the new Ocean Science Centre Mindelo.